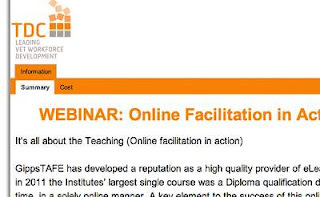 Here's one that's too good to miss: via the TDC (Tafe Devt Corp), Brad Beach from GippsTafe talks about Online Facilitation. Brad has been one of the truly significant leaders in this field for some time, and GippsTafe have run great workshops in online facilitation. Online facilitation is one of the major skillsets that i think people often overlook as they get into setting up online communities and networks. Whether it's real time web-conferencing (synchronous) or round-the-clock discussion forums (asynchronous), there are many strategies you can collect and develop to help you draw people in and engage your community. Yes it costs $60 and it's only an hour, but it would be worth signing up i'd say. Let's start at the very beginning - new projects!